It's been a tour from hell for Australia so far. Their ICC World Twenty20 campaign (remember that?) lasted all of three days; they then contrived to lose the Ashes despite appearing to dominate all but a handful of (ultimately critical) sessions, and finally over the Bank Holiday, they were denied a bounce-back victory when rain wrote off the first Twenty20 at Old Trafford, before causing a complete washout in the return fixture two days later. Aside from a one-sided thrashing of Scotland in Edinburgh, it's been slim pickings of late. But now here's a chance to claim some belated honours - seven ODIs in London, Southampton, Nottingham and Chester-le-Street, starting with a day/night fixture at The Oval on Friday. England themselves know what succour the 50-over format can provide to losing Ashes campaigns, having rounded off their whitewash tour in 2006-07 by swiping the CB Series - and Australia will not be starting the series from a position anything like as bleak as England's back then. The Aussies looked on with amusement as England's final preparations descended into a football-related farce after Joe Denly was clogged by his team-mate Owais Shah, and their incentive to exact their Ashes revenge is epitomised by the frustration that has been steaming out of Brett Lee's ears during his banishment from the Test line-up. Should Australia somehow lose this series 5-2 then they will slip behind England in the one-day rankings, but surely they/ve suffered enough indignities, individually and collectively, for one tour? 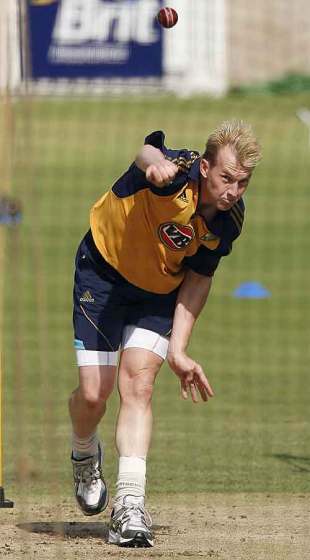 Brett Lee does not have many recent fond memories of The Oval. He was overlooked for the Ashes decider on this ground last month, having been humiliated by Chris Gayle back in June, when Australia bombed out of the ICC World Twenty20 amid some of the biggest six-hitting ever seen in South London. But to say he is motivated right now is something of an understatement. Joe Denly did not know what had hit him when he fell to the first and only ball of his Twenty20 career to date at Old Trafford, as Lee cranked up the pace yet somehow retained a subtlety, as his slower ball to Jonathan Trott in the same over demonstrated. Right now he's playing for his international future, and England know it. Ravi Bopara has suffered a rough time since the Ashes began. He managed 105 runs in seven innings before being dropped for the fifth Test, and has since followed up with one run in two attempts since returning to the top of the order for the limited-overs campaign. But he still retains the faith of his captain, Andrew Strauss. "It's important to keep things in perspective," he said. "International cricketers go through periods of good form and bad form. We're not robots, and if you're a good player you remain a good player, even if you're out of nick. He'll benefit from going out and expressing himself in the first ten overs, and that will clarify his gameplan." Denly's demise means Eoin Morgan will surely return to the middle order, having been overlooked against his old team-mates, Ireland, in favour of England's Oval Test hero, Jonathan Trott. Trott has not been selected for this squad as yet, but could well return to the reckoning if Denly is ruled out for the whole campaign. Strauss, who sat out the Ireland fixture as well as the Old Trafford washouts, returns to the top of the order as captain, with Paul Collingwood returning to the ranks. England (possible) 1 Ravi Bopara, 2 Andrew Strauss (capt), 3 Matt Prior (wk), 4 Owais Shah, 5 Paul Collingwood , 6 Eoin Morgan, 7 Luke Wright, 8 Stuart Broad, 9 Graeme Swann, 10 James Anderson, 11 Ryan Sidebottom. Australia have been forced to field their third international keeper of the summer - and their fourth in all contests - following Brad Haddin's return home for surgery on his broken finger. And Tim Paine, his understudy, could well be asked to open the batting as well, with Clarke keeping Ponting's No. 3 berth warm in his absence. Australia (possible) 1 Shane Watson, 2 Tim Paine (wk), 3 Michael Clarke (capt), 4 Michael Hussey, 5 Callum Ferguson, 6 Cameron White, 7 James Hopes, 8 Mitchell Johnson, 9 Nathan Hauritz 10 Brett Lee, 11 Nathan Bracken. It looks dry out there, which is a start. After the bog of Belfast and the mudbath in Manchester, anything firm underfoot will suit the sides nicely. An added consideration will be the Oval floodlights, which are something of an unknown quantity in English conditions. England have won their last five completed ODI matches in a row, a run of form they have not emulated since their tour of Zimbabwe and South Africa in 2004-05. Australia have won seven of their last ten ODIs against England, including six in a row in the 2006-07 CB Series ... which England somehow claimed in the final. The sides have not met over 50 overs since the World Cup in Antigua in April 2007 (which Australia won, of course). "I suppose, from our recent experiences in one-day cricket, we are looking to improve our consistency, we have see-sawed from very good to very bad, and that's something we need to address." Andrew Strauss puts his finger on England's failings over 50 overs. "Because we didn't get the result we wanted, I see more reason to get out here and have a really good one-day series, so we leave England with some positives. Winning this series is pretty important." Michael Clarke wants to finish a tough tour on a high.